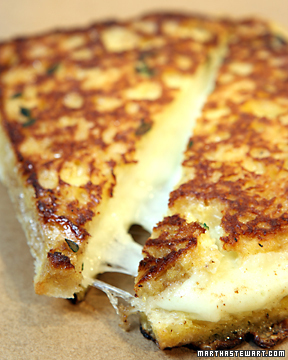 Place the mozzarella on 4 slices of the bread. Cover with the remaining slices to form sandwiches. Trim the crusts off to make perfect 4-inch squares. In a wide shallow bowl, whisk the eggs. Add the cream, thyme leaves, salt, and nutmeg. Whisk until well blended. In a 10 to 12-inch nonstick saute pan, heat 2 tablespoons of olive oil over medium-high heat until smoking. Add 1 tablespoon of the butter and cook until the sizzling subsides. Dip 2 of the sandwiches into the egg mixture, turning to coat, place in the pan, and cook until golden brown on the first side, about 2 minutes. Flip over and brown on the other side. Transfer the sandwiches to individual plates and repeat the process with the remaining 2 tablespoons olive oil, 1 tablespoon butter, and 2 sandwiches. Cut in half, and serve immediately.